After breakfast, you leave your lodge for morning game drive. After lunch, you will exit the park through Naabi Hill gate in the direction of Ngorongoro and Oldupai Gorge (this is the original name of the so called “Olduvai Gorge”). This is found to the North West of the Ngorongoro crater; it is about 55 km in length and its depth varies from 30 to 100 meters. Movements of Earth produced various fault in the sediment and led to the exposure of five different layers which provide documentation of ancient life through fossils and artifacts dating back to 2 million years. You can visit the Oldupai Gorge museum and ask for questions concerning the importance of the site for the history of the humanity. Optional: you can visit one of the Maasai “bomas”, the typical village of the Maasai. This tribe has migrated to the Ngorongoro area about 200 years ago and it has always lived in harmony with the rest of the environment. There are about 42 thousand Maasai pastoralists living within the Ngorongoro area, with their cattle, donkeys, goats and sheep. 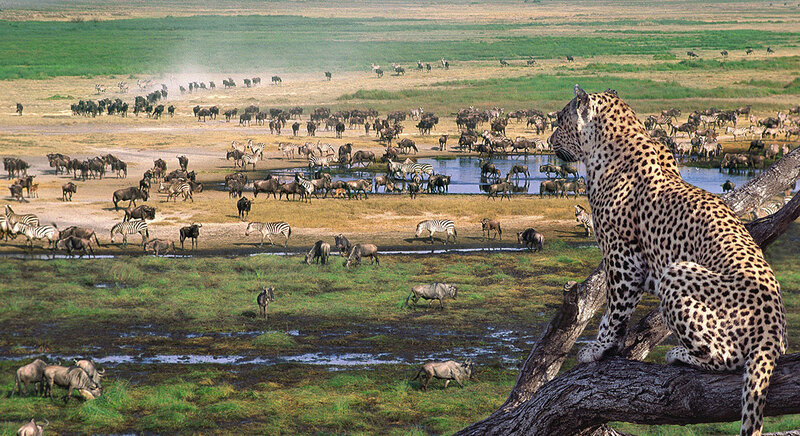 The Masai are allowed to graze freely within the protected areas.